In Mayor Blakespear’s recent newsletter, she updated us on a new bike path and new Rossini Creek Bridge. Both these projects will provide safer and improved active transportation options in Cardiff-by-the-Sea and support better connectivity in the community. Read below to see what Mayor Blakespear has to say about it. Working on New Ways to get Around Town! There’s promising news this week about new ways to move around Encinitas! One of my favorite parts of being your mayor is helping to guide us toward a more diverse, healthier and efficient transportation infrastructure – a system that will have a positive, lasting effect on our lives. 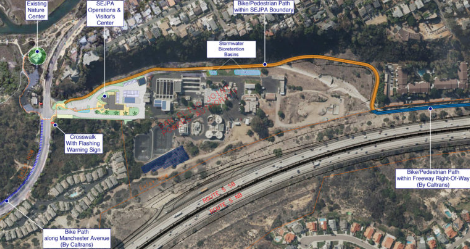 I’m thrilled that the San Elijo Joint Powers Authority (also known as the Cardiff wastewater district) has reached an agreement with Caltrans for the construction of a pedestrian and bike trail connecting Birmingham Drive to Manchester Avenue through the wastewater district and other portions of public right of way (see photo above). This bike path is off-the-road, and it’s a perfect example of a project that took lots of energy and will from many to negotiate. Some projects are harder than others to accomplish. And after months of negotiation I’d definitely say this one was on the more difficult side. Congratulations to everyone who helped make this local mobility dream into reality! Construction is set for 2019. Although you can’t tell from the picture, the freeway widening project also includes a bike path adjacent to the freeway so longer-distance commuters have a direct path to the north and south. This week, together with Solana Beach Mayor David Zito (seen at left in photo above), I co-hosted a “community conversation” organized by SANDAG to solicit feedback on the principles that will underlie the upcoming Regional Transportation Plan. This document will lay out transportation planning in the county until 2050. You can participate in the conversation via this short survey which asks us to choose between really interesting trade-offs in the effort to see transportation improvements. It’s a pretty absorbing survey, actually. For more information about the regional plan, click here. The pedestrian/bike bridge over the outlet of Rossini Creek in Cardiff was installed this week. It’s an important part of the Cardiff Rail Trail, and will be open to all of us soon. Anyone who enjoyed playing with toy cars and erector sets as a kid might appreciate these photos of the bridge being lowered into place!